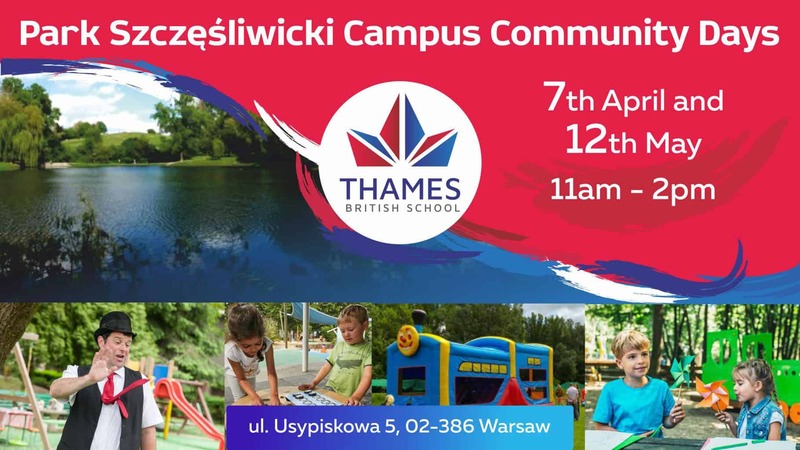 Thames British School Warsaw would like to invite families to our Community Days which take place on a Sunday – the perfect day for a fun family day out. 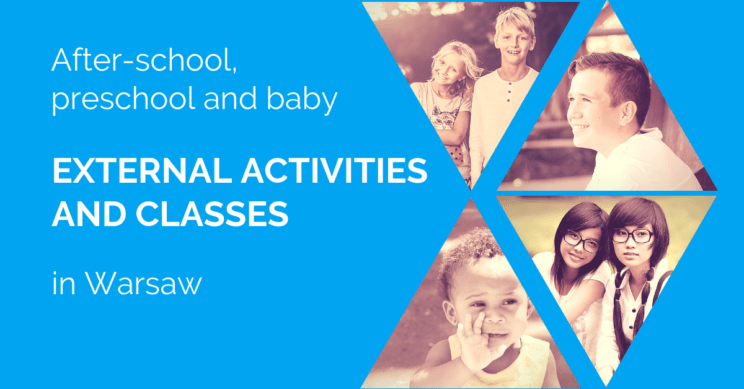 We will have a variety of interesting activities and games for children of all ages (that includes parents as well!). 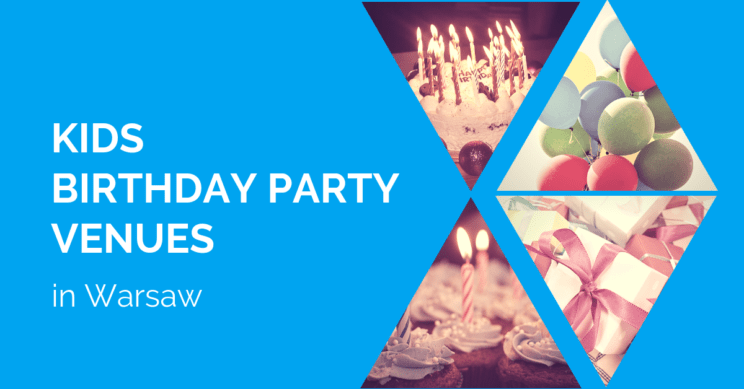 These activities will include: Music, Dance and Magic Performances, A Book Fair, Arts and Crafts, Coding Activities, Food Stalls, Outdoor Entertainment, Fundraising for a Local Charity. The event is free! Click here to read more in English. A bank/public holiday in Poland. Stores, malls, shopping centers, public institutions, schools are CLOSED. You can always do basic shopping at major gas stations (which are open 24/7). Some smaller local convenience stores can be open (eg. Żabka). In Warsaw and other cities in Poland, there are political marches to promote workers rights. May 1 starts so-called długi weekend (long weekend) in Poland – Majówka (please note that May 2 is a regular working day, however schools are closed and people usually take a day off). People often go out for a short vacation. Warsaw is empty and quiet during long weekends, while Polish seaside, Zakopane, and other major touristic destinations get crowded. Location: Royal Łazienki Garden, Agrykola 1 Street, 11 am – 6 pm, free entrance. Attractions include games for children and adults, arts & crafts workshops, juggling workshops, acrobatic and dance show. Facebook event in Polish. On May 1-3, free entrance to all Łazienki museums, including Palace on the Isle (10 am – 8 pm). Location: Royal Łazienki Garden, Agrykola 1 Street, hippodrome, 2.30 pm, free entrance. Facebook event in Polish. Detailed agenda in Polish. Location: Krakowskie Przedmieście Street (12 pm – 6 pm), Multimedia Fountain Park – Podzamcze, Skwer Dywizji 1 (7 pm – 8.30 pm), free entrance. Attractions include concerts of Polish music and groups from other European countries, European folk dance shows, contests, street theaters, attractions for children in the area of Skwer Hoovera – arts & crafts workshops, games, fairy tales from different countries. Facebook event in Polish. Location: Plac Zamkowy 4 / Castle Square 4, 10 am – 6 pm. Click here to read more in English. Location: ‘Wisłostrada’ Street along the Vistula river (Wybrzeże Gdańskie and Wybrzeże Kościuszkowskie Streets). The military parade will start at 2 pm next to the Multimedia Fountain Park (Sanguszki Street), and will finish at the intersection with Karowa Street. Please note that the streets in the area will be closed for a car traffic. Location: Skwer Dywizji 1 (city center). Fountains operate every day from 8.30 am until 10.30 pm. Multimedia show: 9.30 pm (fountains, laser, music, and lights). Click here to read our tips in English – how to get there, where to have lunch, where to find a parking spot. Facebook event in Polish. Location: Warsaw Old Town, next to the Castle Square and Sigismund’s Column, free entrance, 11 am – 9.30 pm. Facebook page in Polish. Location: Czersk Castle (Zamek w Czersku), Plac Tysiąclecia 1, 05-530 Czersk (south of Warsaw, 45 km from the center of Warsaw), 12 pm – 6.30 pm, regular ticket 8 PLN, reduced ticket 5 PLN. Attractions include court and plebeian fashion show, sword fighting shows, archery track, weapons and armor, games, crafts. Facebook event in Polish. The event runs until May 5. Location: Anielewicza 6 Street (Muranów), 10 am – 6 pm. Click here to read our tips in English – opening hours, tickets, etc., and click here to see the photos and read our feature story in English about visiting the POLIN Museum with children. Location: Stanisława Kostki Potockiego 10/16 Street, 9.30 am – 6 pm, online tickets (free admission for children under 7). Click here to read Kids in the City tips in English on visiting the Wilanów Palace Museum and Park. Location: Stanisława Kostki Potockiego 10/16 Street, 9 am – 8 pm, online tickets (free admission for children under 7). 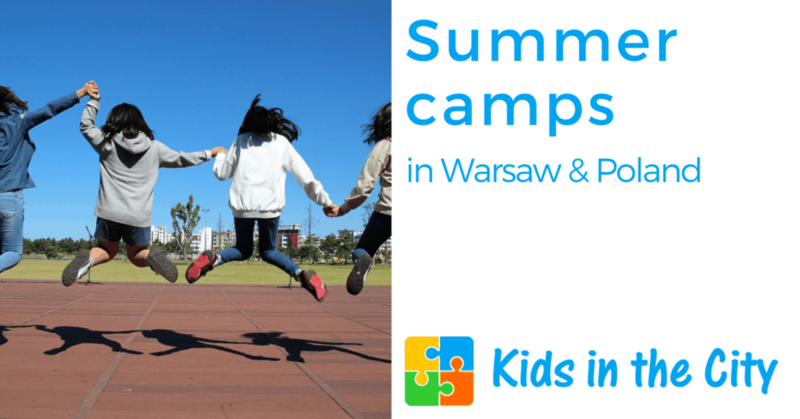 Click here to read Kids in the City tips in English on visiting the Wilanów Palace Museum and Park. Location: Royal Łazienki Garden, Agrykola 1 Street, 10 am – 8 pm, free entrance. Click here to read our tips in English. Location: Wybrzeże Kościuszkowskie 20 Street (Powiśle), 9 am – 7 pm. The Copernicus is very popular – buy tickets online to make sure you will enter! Click here to read our tips in English about visiting the Copernicus (where to have lunch, parking lots, etc.). Location: Wybrzeże Kościuszkowskie 20 Street (Powiśle), 10 am – 8 pm. Click here to read our tips in English about visiting the Copernicus (where to have lunch, parking lots, etc.). Location: Aleje Ujazdowskie 4 (city center, next to the Łazienki garden), 10 am – 8 pm, regular tickets 12 PLN, reduced tickets 6 PLN, children up to 6 free entrance. Click here to read why it’s worth visiting the Garden with children, and here to read our tips in English. Location: Plac Defilad 1 (the Palace of Culture and Science). 9 am – 7 pm. Click here to read our tips in English about visiting the Museum. Location: Okólnik 1 Street (Powiśle). 11 am – 8 pm. Click here to read our tips in English about visiting the Chopin Museum. Location: 96-503 Sochaczew, Żelazowa Wola 15 (60 km from Warsaw), 9 am – 7 pm. Click here to read our tips in English about visiting the Museum. Location: the Palace of Culture and Science, pl. Defilad 1, entrance from Marszałkowska Street, 9 am – 8 pm, tickets: regular 35 PLN, reduced 19 PLN, family 2+3 100 PLN, children up to 3 free entrance. Over 80 metal figures inspired by characters from movies and cartoons, sports cars and motorcycles. More in English about the exhibition. Facebook page in Polish. Location: the Palace of Culture and Science, pl. Defilad 1, entrance from Marszałkowska Street, 10 am – 7 pm, tickets: regular 18 PLN, reduced 12 PLN, family 2+2 50 PLN, children up to 4 free entrance. More in English and photos. Facebook event in Polish. Location: Aleja Na Skarpie 20/26 Street (city center), the garden of Muzeum Ziemi PAN (Museum of the Earth), 10 am – 8 pm. Tickets to be purchased online or at the ticket office (you can pay with a card). Facebook event in Polish. Location: Warszawianka swimming pool, Merliniego 4 Street (Mokotów). Opening hours: 6.30 am – 10 pm. Website in English. Location: Mini Zoo, Zwoleńska 66 Street (Wawer), 11 am – 7 pm, regular tickets 28 PLN, reduced tickets 22 PLN. Website in Polish. Facebook event in Polish. Location: Ratuszowa 1/3 Street (Praga), 9 am – 6 pm. 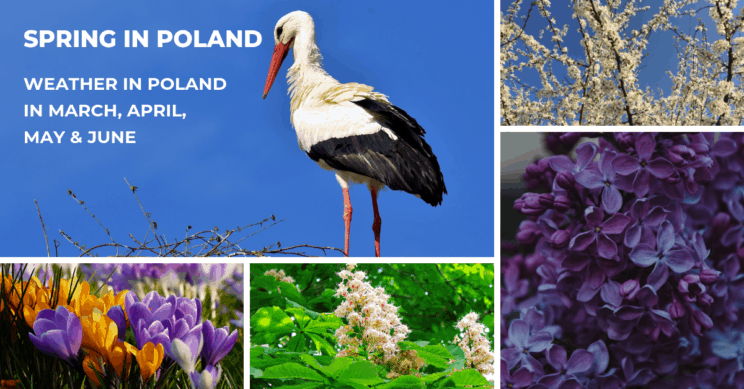 Click here to read tips in English about visiting the Warsaw Zoo. The Zoo is open every day, including all public holidays! Location: The Royal Łazienki Garden, Agrykola Street, free entrance. More in Polish about the Exhibition. 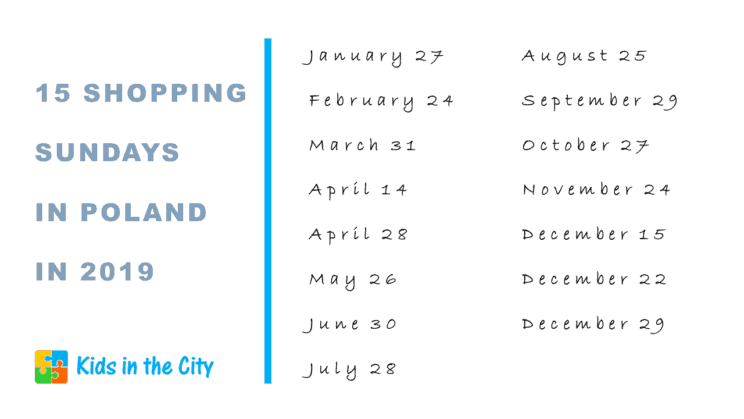 In May 2019, there is only one shopping Sunday in Poland: May 26. May 5, May 12, and May 19 are trade ban Sundays. Click here to read our post about the Sunday trade ban in Poland, shopping Sundays, and bank holidays in Poland in 2019. Bank/public holiday in Poland. Stores, malls, shopping centers are closed. Only some smaller local convenience stores can be open. Stores at gas stations are open every day, 24 h. In Warsaw and other major cities in Poland, there are political marches to promote workers rights. Working day. Stores are open. 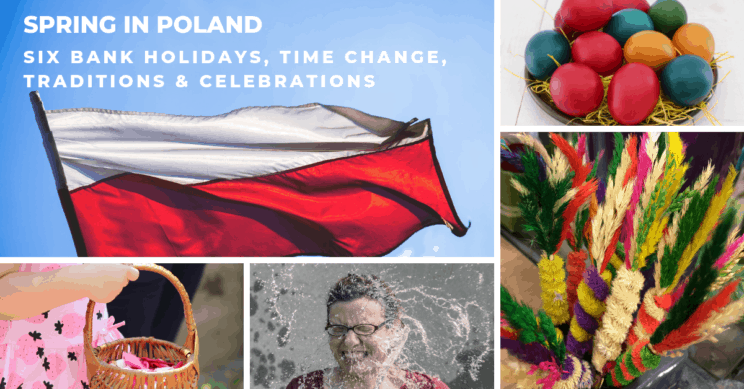 It’s a relatively new holiday in Poland (introduced in 2004). You can notice Polish flags in some private windows and balconies as well as displayed in public institutions buildings. Bank/public holiday in Poland. Stores, malls, shopping centers are closed. Only some smaller local convenience stores can be open. Stores at gas stations are open every day, 24 h. The May 3rd Constitution was passed in 1791 and is claimed to be the first written constitution in Europe and second one in the world (after the American one). Constitution Day is celebrated with speeches, military parades, picnics. It is a day when you visit or call your mum, send her a card, flowers or other gifts. Father’s Day in Poland is celebrated on June 23. Location: Łazienki Royal Garden, 10 am – 11 am. The yoga class takes place outdoors in the Park (check out the exact location on the map). In case of very bad weather, the class is canceled (you will find info in the FB event). Facebook event in Polish. Location: Wilanów Palace, Stanisława Kostki Potockiego 10/16 Street, 12 pm – 1 pm. Online tickets (regular tickets 20 PLN, reduced tickets 15 PLN). Meeting point – a cloakroom in the Palace. More in English. Location: Marriott Hotel (Baltic Room), Jerozolimskie 65/79 Street (city center), 9 am – 3 pm, free entrance. Accessories, clothing, color consultation, hair styling, hand spa, body massage, make up, face yoga, personal training and more. Click here to read more in English. Location: Wilanów Palace Garden, Stanisława Kostki Potockiego 10/16 Street, 11 am – 12.30 pm, meeting point at the ticket office (small yellow building). Tickets: 10 PLN (online tickets). In May: ‘Looking for flowers and butterflies’ – Colorful flowers attract insects, including butterflies. 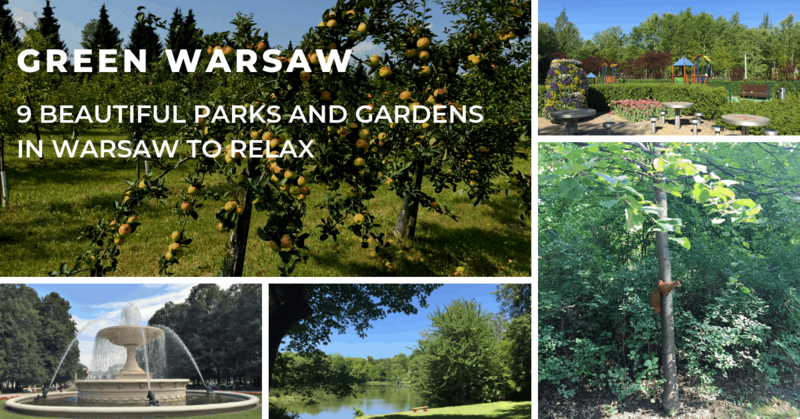 Let’s take a walk through the landscape parks of Wilanów and try to find them. Facebook event in English. Click here to read more in English. Location: Usypiskowa 5 Street (Ochota), 11 am – 2 pm, free entrance. Attractions include Music, Dance and Magic Performances, A Book Fair, Arts and Crafts, Coding Activities, Food Stalls, Outdoor Entertainment, Fundraising for a Local Charity. Click here to read more in English. Facebook event in English. Location: Mazowiecka 43 Street (Bobrowiec near Piaseczno), 11 am – 2 pm, free entrance. Attractions include Music, Dance and Magic Performances, A Book Fair, Arts and Crafts, Coding Activities, Food Stalls, Outdoor Entertainment, Fundraising for a Local Charity. Click here to read more in English. Facebook event in English. Location: Kalatówki 24 Street (Mokotów), 10 am – 12 pm. 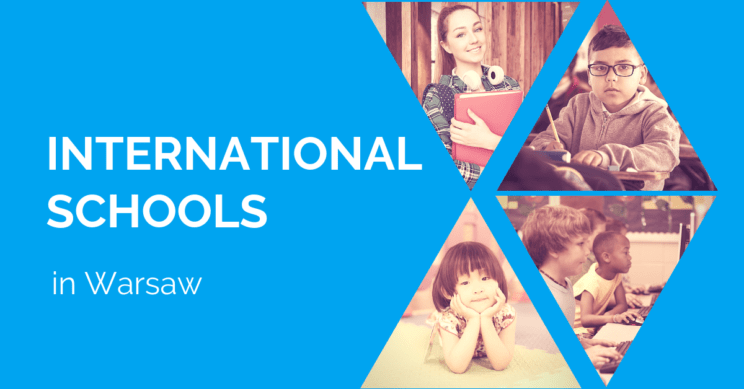 Click here to read more about the International Preschool of Warsaw. Facebook event in English. Location: Badowska 19 Street (Mokotów), 6 pm. Click here to read more in English about the Warsaw Montessori Family. Facebook event. Location: Centrum Praskie Koneser (Praga Koneser Center), Plac Konesera (Praga), 8 am – 4 pm, free entrance. Regional food, vegetables, fruits, preserves, fish, cheese, meat, honey, sweets. Facebook event in Polish. Location: Skwer Dywizji 1 (city center). Fountains operate every day from 8.30 am until 10.30 pm. Multimedia show on May 1, 2, 3, 4: 9.30 pm, from May 10 each Friday and Saturday in May at 9.30 pm (fountains, laser, music, and lights). Click here to read our tips in English – how to get there, where to have lunch, where to find a parking spot. Location: Skwer Grupy AK “Granat”, corner of Puławska and Woronicza Street (Mokotów), 10 am – 5 pm. Breakfast Market is a weekend picnic where you can buy local, international, and organic food, and rent a picnic blanket. Facebook event in Polish. Location: The Royal Łazienki Garden, Palace on the Isle. Tickets: 25 PLN, reduced 18 PLN, on Thursdays admission is free. Tuesday – Wednesday: 9 am – 4 pm; Thursday 10 am – 8 pm, Friday – Sunday 9 am – 4 pm. ‘Landscape with the Good Samaritan’ is one of only three confirmed works by Rembrandt in Polish collections. More in English about the Exhibition. Location: Warsaw Old Town, next to the Castle Square and Sigismund’s Column, free entrance. Sunday-Thursday 11 am – 8 pm, Friday-Saturday 11 am – 9.30 pm. May 1-3: 11 am – 9.30 pm. Facebook page in Polish. Location: Galeria Retroavangarda, Jerozolimskie Business Park, Aleje Jerozolimskie 146D Street (Ochota), Tuesday – Friday 11 am – 7 pm. The exhibition showcases over 200 original, handmade pieces crafted by masters of collage from dozens of countries. More in English about the Exhibition. Location: Czersk Castle (Zamek w Czersku), Plac Tysiąclecia 1, 05-530 Czersk (south of Warsaw, 45 km from the center of Warsaw), 12 pm – 6.30 pm, regular ticket 8 PLN, reduced ticket 5 PLN. Attractions include court and plebeian fashion show, sword fighting shows, archery track, weapons and armor, games, crafts. Facebook event in Polish. Location: the area in front of the Palace / Museum of King Jan III’s Palace in Wilanów, Stanisława Kostki Potockiego 10/16 Street, 12 pm – 5.30 pm, free entrance. Facebook event in Polish. 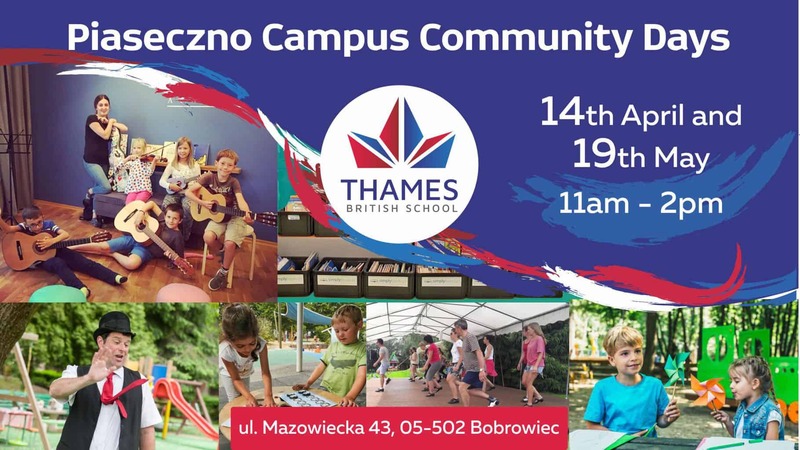 Location: Port Czerniakowski, 9 am – 4 pm, free entrance. Concerts, workshops for families, sports competitions. Facebook event in Polish. Location: Nowy Fort, Stefana Czarnieckiego 51 Street (Żoliborz), free entrance, 11.38 am – 8 pm. Facebook event in Polish. Location: Royal Łazienki Garden, Agrykola 1 Street, hippodrome, 10 am – 3 pm, free entrance. Horse riding tournament, horse show, a show of the military drill. Detailed agenda in Polish. Location: Iskra Club at Pole Mokotowskie, Wawelska 5 Street (Mokotów), 12 pm – 7 pm. There will be a chance to buy Polish dumplings (pierogi) as well as “dumplings” from other countries, eg. calzone, samosa, momo, khinkali etc. Facebook event in Polish. Location: Pole Mokotowskie park (Mokotów), 11 am – 5 pm, free entrance. Facebook event in Polish. Location: Ptak Warsaw Expo in Nadarzyn, Al. Katowicka 62 Street, 05-830 Wolica 114D. Four zones: Home & Hobby, Audio & Video & Photo, E-mobility, New Technologies. Facebook event in Polish. Website in English. Location: Skwer Stefana Kisielewskiego (Park), 05-500 Piaseczno, 10 am – 8 pm, free entrance. Facebook event in Polish. Locations: Kinoteka, Kino Luna, Kino Iluzjon, Kino Muranów, POLIN Museum. The biggest documentary film festival in Poland. Foreign films are screened with Polish subtitles. Most films (all competition films) are screened with English subtitles. The Festival website in English. Facebook event in Polish. Location: Krakowskie Przedmieście Street (skwer Hoovera), free entrance, 10 am – 3 pm. Pro-European Union event: open-air events like concerts, games, debates. Facebook event in Polish. Location: PGE National Stadium (Stadion Narodowy), Al. Ks. J. Poniatowskiego 1 Street (Praga). Free entrance, 11 am – 8 pm. A huge outdoor event promoting science, organized by the Polish Radio and the Copernicus Science Centre in cooperation with universities, research institutes, museums, cultural institutions. They present the behind-the-scenes aspects of their everyday work through experiments, demonstrations, and interactive exhibits. Click here to read more in English. Facebook event in Polish. Location: ‘Elektrownia Powiśle’, Elektryczna 2 Street (Powiśle), free entrance, 11 am – 7 pm. Fashion, accessories, jewelry, cosmetics, home accessories, plants. Facebook event in Polish. Location: Sports Center at Siennicka 40 Street (Praga), 10 am – 5.30 pm. More in Polish. Location: Czersk Castle (Zamek w Czersku), Plac Tysiąclecia 1, 05-530 Czersk (south of Warsaw, 45 km from the center of Warsaw), 12 pm – 6 pm, regular ticket 10 PLN, reduced ticket 5 PLN. Attractions include knights tournaments (groups from Poland and abroad), duels with medieval weapons, horse and archery shows, games, historical fair. Facebook event in Polish. Location: Ptak Warsaw Expo in Nadarzyn, Al. Katowicka 62 Street, 05-830 Wolica 114D. The exhibition, a retro-car market, meetings, military zone, car renovation area, auto-parts. Facebook event in Polish. Website in English. Location: Arkady Kubickiego (Kubicki Arcades) at the Warsaw Royal Castle, Saturday-Sunday 11.15 am – 9 pm, Monday 11.15 am – 4 pm, free entrance. Facebook event in Polish. Location: Warsaw Railway Museum (Stacja Muzeum), Towarowa 3 Street (Wola), 10 am – 2 pm (the Museum is open 10 am – 6 pm). A chance to buy model railways and trains and meet railway modeling enthusiasts. During the event reduced tickets for every one (6 PLN, children up to 7 free entrance). Facebook event in Polish. Location: Arena Ursynów, Pileckiego 122 Street, 9 am – 5 pm. Facebook event in Polish. Location: Dom Towarowy Bracia Jabłkowscy, Bracka 25 Street (city center), 11 am – 6 pm. Facebook event in Polish. Location: “Znajomi Znajomych”, Wilcza 58a Street (city center), free entrance, 12 pm – 6 pm. Facebook event in Polish. Location: University of Warsaw Botanic Garden, Aleje Ujazdowskie 4 (city center, next to the Łazienki garden), 10 am – 6 pm, regular tickets 12 PLN, reduced tickets 6 PLN, children up to 6 free entrance. Click here to read why it’s worth visiting the Garden with children, and here to read our tips in English. Facebook event in Polish. Location: Multimedia Fountain Park, Podzamcze, Skwer Dywizji 1 (city center), 12 pm – 6 pm, free entrance. Picnic event promoting a positive attitude toward animals; dog frisbee show, animals first aid demonstration, adoption advice, contests with prizes. Facebook event in Polish. Over 250 Warsaw institutions are open during the night: galleries, museums, theaters, government buildings. Facebook event in Polish. Location: Łazienki Royal Garden, Agrykola 1 Street, free entrance, 10 am – 6 pm. Attractions include sports and music activities, Israeli dance workshops, traditional food, concerts. Facebook event in Polish. Location: Plac (square) Konesera 2, Centrum Praskie Koneser (Praga), 11 am – 10 pm, free entrance. Clothing, jewelry, accessories, articles for children, design, decorations, natural cosmetics, vinyl records, food court. Facebook event in Polish. Location: Plac Defilad, the area in front of the Palace of Culture, Saturday 12 pm – 3 am, Sunday 12 pm – 8 pm, free entrance. Facebook event in Polish. Location: Warsaw University of Life Sciences (SGGW), Faculty of Animal Science, Building 23, Ciszewskiego 8 Street (Ursynów), 10 am – 4 pm, free entrance. Facebook event in Polish. Location: Royal Łazienki Garden, Chopin Monument, entrance from Aleje Ujazdowskie Street, free entrance. Each Sunday 2 live concerts: 12 pm and 4 pm. Facebook event in Polish. Location: PGE National Stadium, Al. Ks. J. Poniatowskiego 1 Street (Praga), online tickets. New books and bestsellers, a chance to get an autograph, attractions for children and teenagers, comic zone. Facebook event in Polish. The Fair website in English. Location: Praga Południe Sports Center, Angorska 2 Street, 10 am – 4 pm, regular tickets 15 PLN, reduced tickets 10 PLN, children up to 6 free. Facebook event in Polish. Location: Kino Muranów, Andersa 5 Street. Jewish themes in contemporary cinematography. English subtitles available. The Festival website in English. Location: PGE National Stadium, Al. Ks. J. Poniatowskiego 1 Street (Praga). Facebook event in Polish. Location: Modlin Fortress (Twierdza Modlin), Generała Józefa Bema 200C Street, 05-160 Nowy Dwór Mazowiecki. Online tickets. Attractions include RPG, manga, anime, games room, fashion shows, concerts. Facebook event in Polish. Agenda in Polish. Location: Ptak Warsaw Expo in Nadarzyn, Al. Katowicka 62 Street, 05-830 Wolica 114D. 800 exhibitors from Poland and abroad: decorative items, interior furnishings, ceramics and glass, everyday products, jewelry, fashion, gifts, business and advertising gadgets, stationery items, souvenirs, small electronics, toys, textiles for children, items from the eco / recycling segment. Facebook event in Polish. Website in English. Location: Ptak Warsaw Expo in Nadarzyn, Al. Katowicka 62 Street, 05-830 Wolica 114D. Trainers, workshops with creators of popular fitness programs, competitions, sports challenges, industry workshops, conferences, training with sports stars and global sports brands. Website in English. Location: Museum of Asia and the Pacific, Solec 24A Street (Powiśle), tickets 5 PLN, children free entrance, 11 am – 6 pm. Facebook event in Polish. Location: Different locations in Saska Kępa, 2 pm – 10 pm, free entrance. The parade starts at 2 pm at the PROM Cultural Center (Brukselska 23 Street). 3 stages: Rondo Waszyngtona, Obrońców Street, Wersalska Street. Other attractions include street food, fair, different performances and concerts. Facebook event in Polish. Location: Arkady Kubickiego (Kubicki Arcades) at the Warsaw Royal Castle, entrance from Grodzka Street. 11 am – 4 pm, free entrance. A chance to admire or buy artworks of students and graduates of the Warsaw Academy of Fine Arts and visit the Kubicki Arcades. Click here to read more in English. Location: Horse Racetrack in Służewiec, Puławska 266 Street. One of the biggest music festivals in Poland. Click here to read more in English. Facebook event in English. Location: Ptak Warsaw Expo in Nadarzyn, Al. Katowicka 62 Street, 05-830 Wolica 114D. The biggest pop-culture festival in Poland: Hollywood stars from the most popular movies and TV series (The Vampire Diaries, Stranger Things, Sherlock), cosplayers, TV zones, concerts, comic books collections, board games. Website in English. Facebook event in Polish. Location: Ptak Warsaw Expo in Nadarzyn, Al. Katowicka 62 Street, 05-830 Wolica 114D. The event is a part of Warsaw Comic Con. Facebook event in Polish. Location: Ptak Warsaw Expo in Nadarzyn, Al. Katowicka 62 Street, 05-830 Wolica 114D. PC games, video games, meetings with YouTubers, board games, VR. The event is a part of Warsaw Comic Con. Facebook event in Polish. Website in Polish.